Have you ever worn your contact lenses longer than recommended or rinsed them with water? Those and other shortcuts can compromise your vision and increase your risk of dangerous eye infections. Following your optometrist's care instructions will help you avoid common contact lens wear pitfalls. Wash Your Hands. You may introduce bacteria into your eyes if you don't wash your hands with soap immediately before handling your lenses. Bacteria can quickly accumulate on your fingers, even if you just washed your hands 10 minutes earlier. Be sure to rinse your hands thoroughly and dry them with a lint-free towel before touching your lenses. Clean Your Cases Frequently. A dirty or germ-laden contact case can increase your risk of an infection. Even though your case may look perfectly fine, it may be teeming with bacteria. Empty your case every day and rinse it with contact lens solution. Don't top off the case with more solution, clean it with water or dry it with a towel or paper towel. Air drying offers the safest drying method. Don't Become Too Attached to Your Cases. 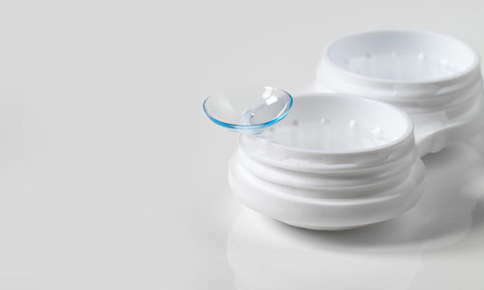 The American Optometric Association recommends replacing your contact lens cases every three months. If the case is broken, cracked or dirty, replace it immediately. Use Contact Lens Solutions Only. Water and saliva aren't good substitutes for contact lens solutions. Acanthamoeba, a micro-organism found in water, can damage your corneas, causing blindness or visual impairment. Leave your contacts in their case when you shower or swim to avoid contamination with the amoeba. Don't use rewetting or saline solution to fill your contact lens cases, as these solutions won't kill microorganisms. Disinfect Your Lenses If You Drop Them. Have you ever rinsed a dropped lens with solution then placed it back in your eye? Although the solution may have removed some bacteria, a few microorganisms probably remained on your lens. If you wear daily disposable lenses, throw away the lens and use a new one. Follow your usual disinfection routine for all other types of lenses. Heeding your optometrist's instructions for contact lens care is the simplest way to avoid discomfort and infections. If you use daily disposable contact lenses, you'll throw away your contact lenses at the end of the day and won't have to worry about cleaning solutions. Other types of lenses require regular cleaning. Squirt a little disinfecting solution on each lens, then gently rub each side for several seconds to remove proteins, lipids and microorganisms. Consult the instructions printed on the solution to determine how long you should rub the lenses. After you rub them, rinse the lenses with the solution, place them in their case and fill the case with fresh solution. Your eye doctor will let you know how often you should clean or replace your lenses, depending on their type. In some cases, your optometrist may alter the wear schedule. For example, although extended wear lenses can be worn overnight, he or she may suggest that you only wear them during the day. Regular visits to the optometrist are a must if you wear contact lenses. If it's time for your next appointment, or you're having a little trouble with your lenses, call us to schedule an appointment.